This is a very interesting project with many practical applications in security and alarm systems for homes, shops and cars. It consists of a set of ultrasonic receiver and transmitter which operate at the same frequency. When something moves in the area covered by the circuit the circuit's fine balance is disturbed and the alarm is triggered. The circuit is very sensitive and can be adjusted to reset itself automatically or to stay triggered till it is reset manually after an alarm. @Bend them at the correct distance from the component's body and insert the component in its place on the board. @Solder then the transistors and the diodes taking care not to overheat them during soldering. The transducers should be positioned in such a way as they do not affect each other directly because this will reduce the efficiency of the circuit. When you finish soldering, check your work to make sure that you have done everything properly, and then insert the IC's in their sockets paying attention to their correct orientation and handling IC3 with great care as it is of the CMOS type and can be damaged quite easily by static discharges. Do not take it out of its aluminium foil wrapper till it is time to insert it in its socket, ground the board and your body to discharge static electricity and then insert the IC carefully in its socket. 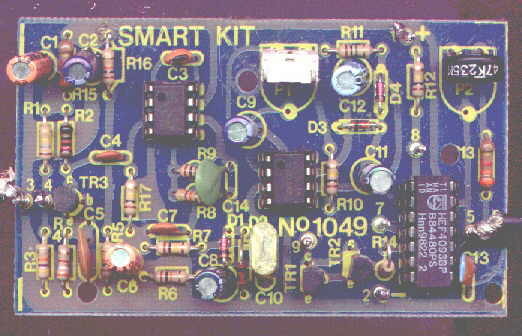 In the kit you will find a LED and a resistor of 560 - which will help you to make the necessary adjustments to the circuit. Connect the resistor in series with the LED and then connect them between point 9 of the circuit and the positive supply rail (point 1). how ultrasonic radar used as speedometer.Help please. this is a good project for final year student. its my request to everyone who had already made this project. please send the whole presentation material,and basic information to implement this project. Can i get the details of the projects and also the cost?